356 mm/45 Mk94 х 3 pcs. Initial HE Shell Velocity834 m./s. 12.7 mm Browning M2 mod. 28 х 1 pcs. 28 mm/75 Mk2 mod. 24 х 4 pcs. 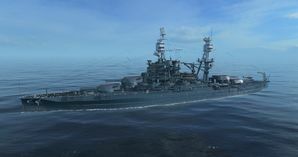 Arizona — American promo premium Tier VI battleship. A U.S. Navy battleship with a conventional layout, with two turrets forward and two aft and her armor distributed according to the "all or nothing" concept. She was designed to engage enemy ships at long range. By the outbreak of World War II, the ship received more powerful torpedo protection, which slightly reduced her maneuverability. USS Arizona was destroyed during the 7 December 1941 sneak attack on Pearl Harbor, Hawaii with heavy loss of life. Her remains can be seen today at the USS Arizona Memorial in Pearl Harbor. Arizona first went on sale on 4 July 2016 on the NA servers, and on 9 July 2016 on the EU servers. Arizona is a Tier VI American battleship. It is similar to other mid-tier US battleships in that it moves at 21 kts and has decent armor. However, it differs from her tech tree counterpart in that her guns have a higher sigma value, making her salvo patterns tighter, and has worse rudder shift and AA. Her guns are great for shooting cruisers and destroyers, but at only 45 calibers long, their penetration starts to become inadequate as battleships start mounting 16-inch guns (and become armored against them), meaning you may have to switch to HE at longer ranges to deal damage and set fires. Her slower rudder shift isn't really noticeable, but combined with the lack of AA, makes her vulnerable to enemy carriers; it's a good idea to seek out anti-aircraft cruiser escorts if there are carriers in the battle, as well as paying careful attention to where enemy planes are at all times. Large health pool; second only to Mutsu’s in Tier VI. Good dispersion, able to reliably hit ships at range. Considerably better armor than New Mexico. Twelve main guns with good accuracy can devastate enemy ships. Worse AA and slower shells, reload and rudder shift than New Mexico. Typically low American battleship mobility. Guns lack penetration power vs higher tier battleships. Short range secondaries only reach 5km with Advanced Firing Training. As a premium ship, Arizona doesn't have any upgrades to research. Mounting premium versions of these consumables is recommended to decrease their cool-down timers. As a premium ship, Arizona comes included with Type 10 camouflage that lowers her detection radius, reduces the accuracy of incoming shells, reduces her repair costs, and increases the amount of experience she earns. Arizona captains should mount the standard flags to improve the ship's performance in battle. India Delta ( ), November Foxtrot ( ), and India Yankee ( ) are all recommended to improve the ship's survivability. Captains may also find Sierra Mike ( ) useful to increase the ship's top speed. Lastly, economic and special signal flags can be mounted to improve the ship’s economic gains per battle. Arizona rests in port ready to go. Arizona’s 14 inch-batteries at rest in port. The red color on top was to identify her as part of Battleship Division (BATDIV) 1, alongside USS Pennsylvania and USS Nevada. 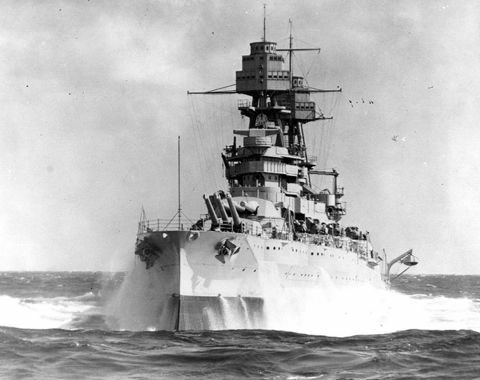 Arizona joins forces with a New Mexico-class battleship. Arizona and a New Mexico-class battleship form the core of the battle group. Arizona fires a broadside against an enemy Molotov. Arizona nails a Japanese Aoba-class cruiser with accurate gunfire. Arizona turns hard to port in an attempt to dodge an enemy destroyer's torpedo attack. Arizona punishes an enemy Nagato with a close range broadside. USS Arizona Memorial Flag. Given to players who purchased a special bundle containing Arizona. Arizona after her modernization during the 1930s. Aside from a comprehensive modernization in 1929–31, Arizona was regularly used for training exercises between the wars, including the annual Fleet Problems (training exercises). When an earthquake struck Long Beach, California, in 1933, Arizona’s crew provided aid to the survivors. Two years later, the ship was featured in a Jimmy Cagney film, "Here Comes the Navy", about the romantic troubles of a sailor. In April 1940, she and the rest of the Pacific Fleet were transferred from California to Pearl Harbor, Hawaii, as a deterrent to Japanese imperialism. During the Japanese attack on Pearl Harbor on 7 December 1941, Arizona was bombed. She exploded and sank, killing 1,177 officers and crewmen. Unlike many of the other ships sunk or damaged that day, Arizona could not be fully salvaged, though the Navy removed parts of the ship for reuse. The wreck still lies at the bottom of Pearl Harbor and the USS Arizona Memorial, dedicated on 30 May 1962 to all those who died during the attack, straddles the ship's hull. Pennsylvania was the only ship of her class to receive a radar antenna on her tripod foremast in early 1942, after the Pearl Harbor attack. Thus the in-game model bears a closer resemblance to Pennsylvania than Arizona. However, missing from this early refit are gun shields for the 5" dual-purpose guns and 20mm Oerlikons replacing the M2 Brownings. Arizona was never armed with 1.1" (28 mm)/75 quadruple guns. She was scheduled to receive them in early 1942 before she was sunk on 7 December 1941. Only her sister ship Pennsylvania survived to be fitted with the 1.1" guns. Aircraft catapult on 'X' turret is missing. Spotter plane has chrome yellow wings, which it carried from 1940 to early 1941; Arizona is in hypothetical 1942 configuration. Her spotter plane should have intermediate blue upper surfaces over gull grey undersides. Keel-laying of USS Arizona (BB-39), 16 March 1914. Arizona under construction, 3 May 1914. Launching of Arizona (BB-39), 19 June 1915. Arizona on the East River in New York City on her way to sea trials in 1916. The Brooklyn Bridge is in the background. Arizona at the New York City naval review, leading ten dreadnoughts that paraded past Secretary of the Navy Josephus Daniels, 26 December 1918. Arizona transiting the Panama Canal in 1921. Arizona with ship's complement, circa 1924. Arizona being modernized in Norfolk, June 1930. Arizona burning after the Japanese attack on Pearl Harbor. The visible superstructure of Arizona after her destruction. Aerial view of the USS Arizona Memorial, showing the wreck and oil seepage from the ship's bunkers. This page was last modified on 14 September 2018, at 16:40. This page has been accessed 106,287 times.